I want to let you know that apparently someone hacked my header and you probably got to see a huge ad for Cialis… well that wasn’t from me… and I don’t know how it got there and I did get it removed or at least I think I did and so that’s why this post is late..I am sorry and I am working to see that it doesn’t happen again. 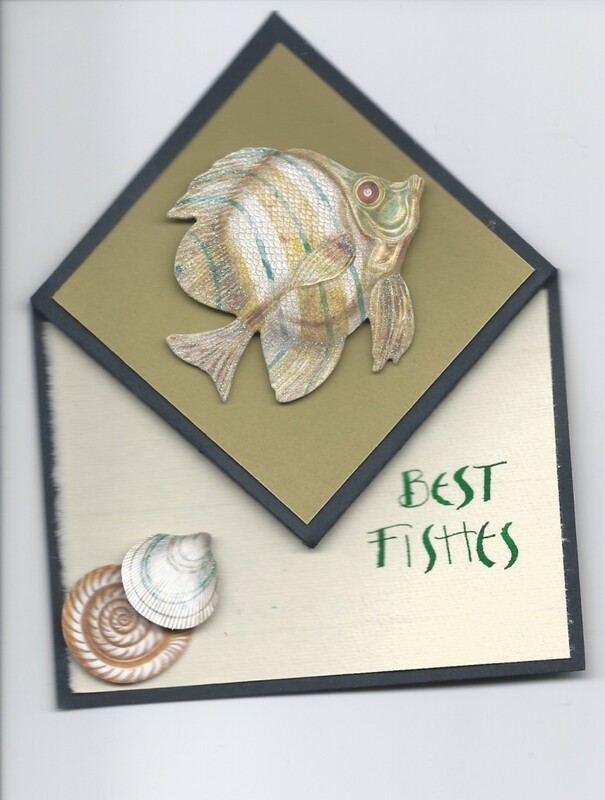 Hope you like this card as much as I do. I also want to apologize for last weeks post it appears that my links to the youtube videos were not working so I did re link them and now think they are working.. 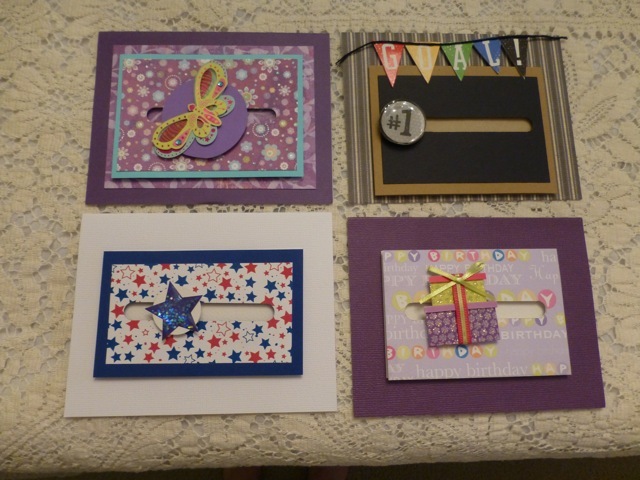 I also a few more samples to show you.. they are not mine but came from the web. BASE….4 1/4 X 9 3/4 INCHES…SCORE FROM THE LEFT SIDE OF 4 1/4 AT 3 1/4.. I had to use it immeadiately so here are a few of the samples I came up with. 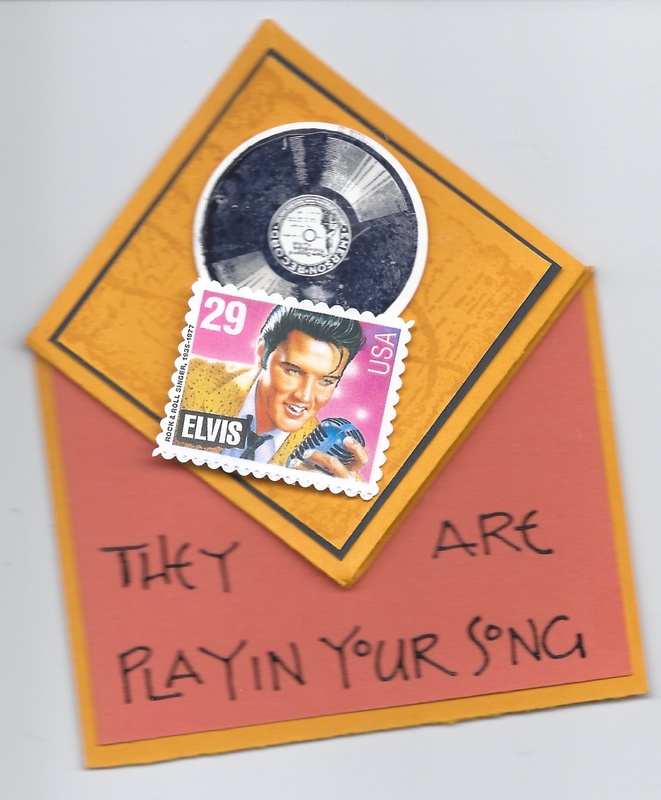 I have a huge collection of postage stamps and I like to scan them and then use them on cards from time to time and the PLAYIN YOUR SONG…is perfect for the Elvis stamp..but you could also use music for background and then there are music note brads out there so those would be cute also. 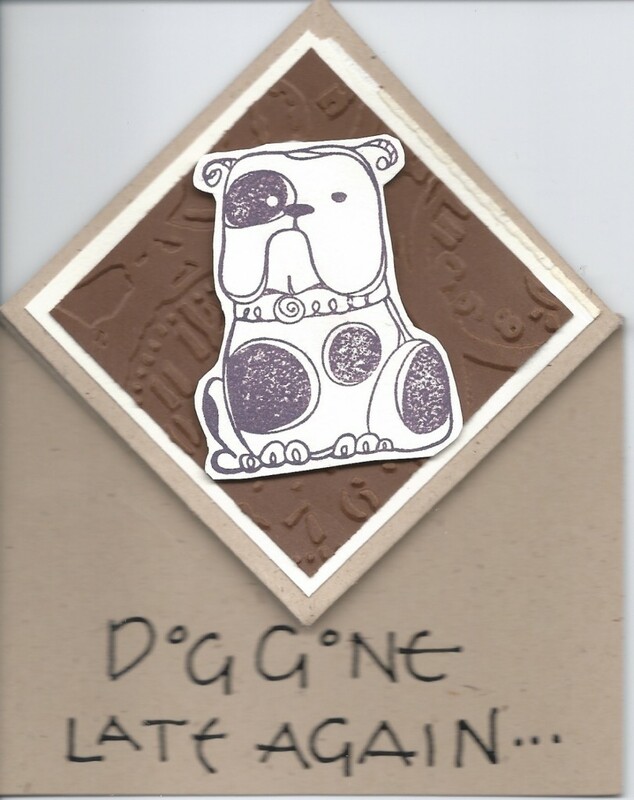 I have several friends who love dogs and I am also late a lot with cards… I get them made in time but then I don’t get them mailed in time… it is a two step process..lol.. I also fell in love with this stamp so I keep finding ways to use him… another saying might be NOW BONES ABOUT IT…then on the back write wishing you a HAPPY BIRTHDAY.. there are dogbone punches as well as dog bone brads so both of those would go well with this image or any dog image…I also have a dalmation dog somewhere and if you use a dalmation you can say… WHERE’S THE FIRE…then on the back ….OH I SEE its all those candles on your cake…HB.. 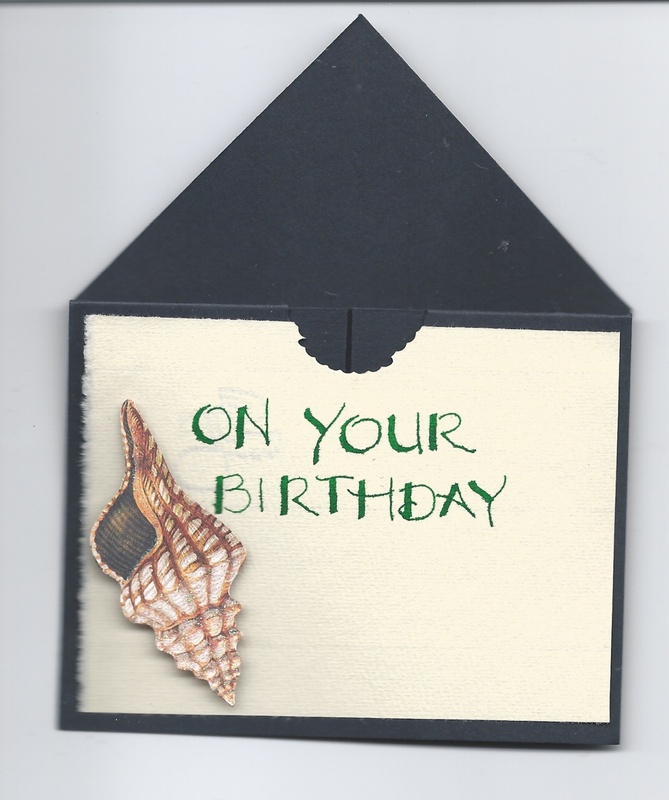 This is the back of the previous image and I used from the same ocean package this sea shell which I really liked. 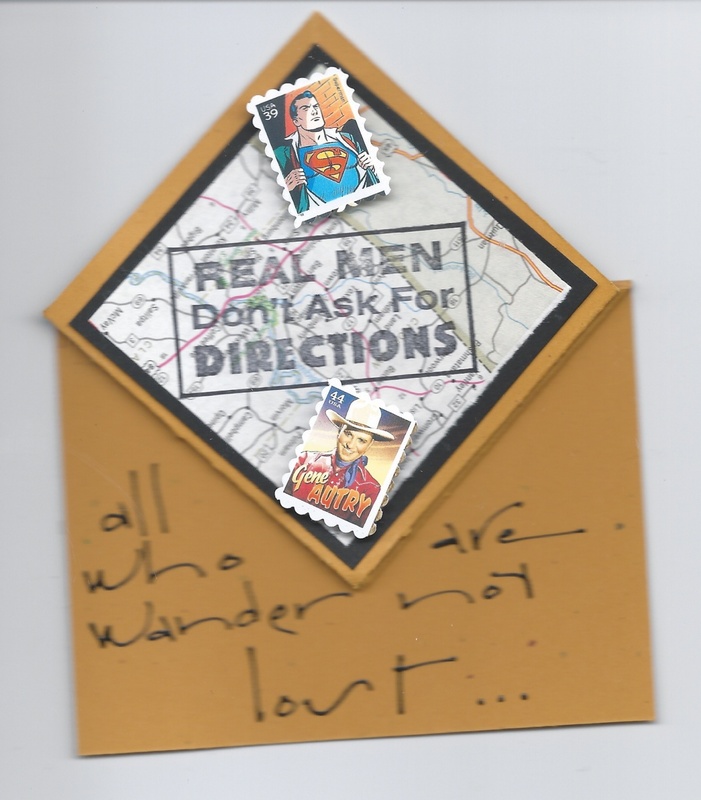 I have had this REAL MEN stamp a long time and used it with lots of images…but my hubby and a friend of his remind me frequently that ALL WHO WANDER ARE NOT LOST … which of course is true so pieces of old maps work well for the background layer and again I used postage stamps of Superman and Gene Autry as embellishments. Now this last one below is my new favorite… I used die cut hearts to create the embellishments. 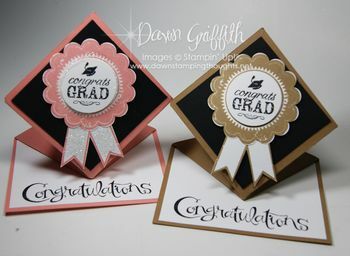 I saw and pinned this image off of PINTEREST and I think it is also a STAMPIN UP design but I am not sure… they were using it as wedding cards which is a terrific idea but at my age I have more anniversaries to celebrate than weddings …but it could happen. ps… sorry for slight blurriness… I am not sure why but will try to figure it out before posting any more images… :-(. 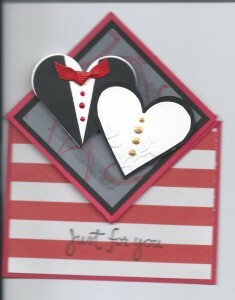 This entry was posted in Cards, Embellishments, HUMOR, TIPS/HINTS, Tools by kath. Bookmark the permalink.